Montreal Confidential, first published in 1950, is a gossipy and sometimes gritty chronicle of Montreal after-dark during the 1950s. Al Palmer, who covered the entertainment and police beat for the Montreal Herald and later the Montreal Gazette, colourfully describes the glamorous cabarets, restaurants, late night bars, singers and dancers, and various underworld characters, when Montreal was an open city. In this new edition, published in its original pocketbook format, the addition of archival photographs of the people and places mentioned in the book compliment Al Palmer's spirited prose. Our Old Man used to always say that you can take the boy out Montreal but you can't take Montreal out of the boy. Some cities are merely bolts on the landscape with the approved collection of steel and stone buildings and the ever-present supermarkets. Most have absolutely nothing to distinguish them from a thousand similar cities. Some, notably New York, New Orleans and San Francisco, have certain characteristics which set them apart from other cities. There is little doubt but that our home town has developed into the most colourful community on the continent. Nothing which New York, New Orleans or San Francisco-or any other city for that matter-can offer that Montreal hasn't more of. It is a helluva town to visit, a helluva town to live in and a helluva town to come back to. We love every grimy square of it. Al Palmer [1913-1971], started his journalistic career as a sports writer. He covered the police beat for the Montreal Herald before becoming one of its featured columnists with "Man About Town." He moved to the Montreal Gazette where he wrote the widely-read column, "Our Town." 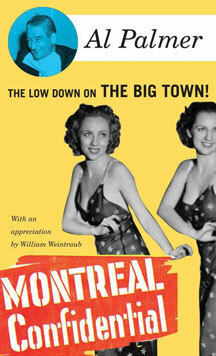 William Weintraub is a Canadian journalist, author, filmmaker, lecturer, and fan of Lili St. Cyr. He provides an entertaining foreword to the book. 140 pp 7" x 4.25"